Over the past few years, HAP40 has become recognized as one of the best steels on the market for the production of high quality, high durability kitchen knives. Unlike other powdered steels, it is fairly easy to sharpen on normal stones while holding a really sharp edge even after prolonged use. No other steel on the CKTG site gets even close to HAP40 in terms of edge retention. The steel is manufactured by Hitachi and it can be hardened up to between 64 and 68 Rockwell. We chose 65-66 HRC as the sweet spot for these knives. 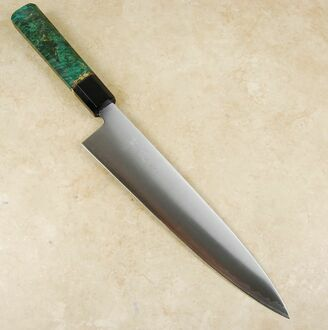 This great looking 240mm gyuto uses the popular Togatta shape, which is a throwback to the French chef knife profile with a thin and refined Japanese grind. 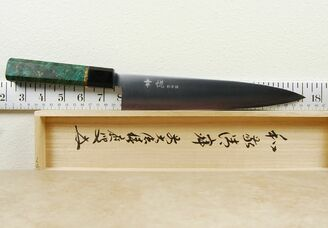 The Kohetsu Togatta 240mm gyuto measures about 50mm at the heel, which is about average compared to other 240mm gyutos but a bit taller than other French profile blades. Its 2.3mm thick spine (at the heel) and 5oz weight are also typical for this type and style of knife. It is quite thin, to the point of being regarded as a laser style blade. There is a slight asymmetrical aspect to the grind but it will still be good for both left- and right-handed users. 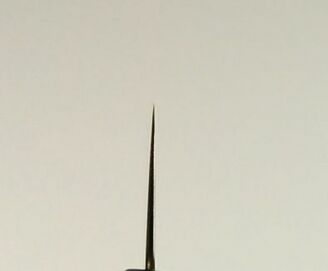 The profile is fairly flat with a bit of belly towards the very thin tip. These knives come out of the box with some of the sharpest edges we have seen.